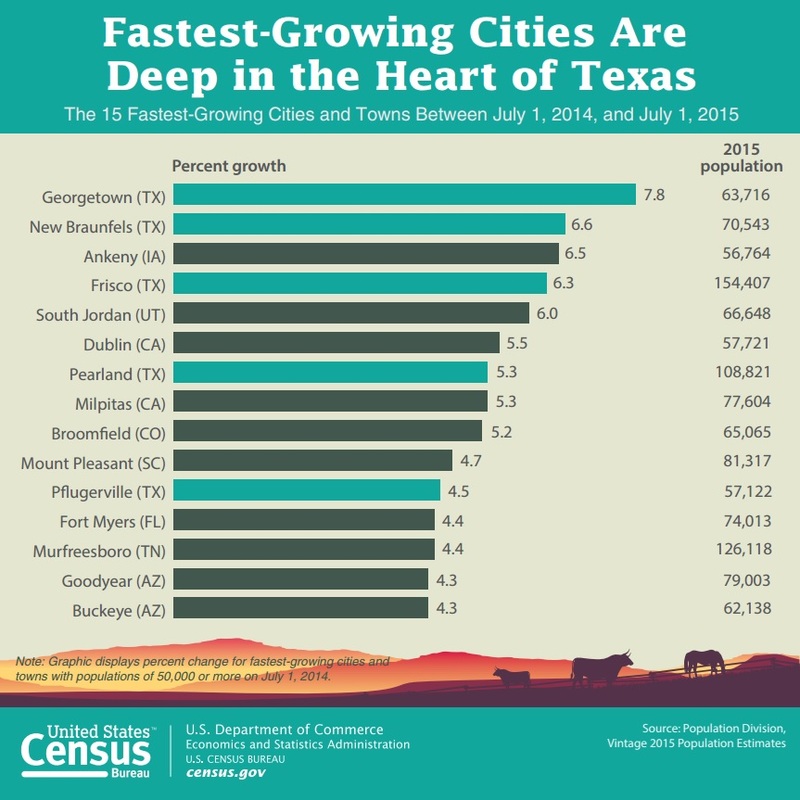 Georgetown, Texas, saw its population rise 7.8 percent between July 1, 2014, and July 1, 2015, making it the nation’s fastest-growing city with a population of 50,000 or more, according to estimates released today by the U.S. Census Bureau. Georgetown is part of the Austin-Round Rock metro area, which crossed the 2 million population threshold in 2015 for the first time, according to statistics released earlier this year. This metro area is also home to Pflugerville, the nation’s 11th fastest-growing large city. Austin itself added more people over the period (19,000) than all but seven other U.S. cities. Texas was home to 5 of the 11 fastest-growing cities (New Braunfels, Frisco and Pearland were the others), and five of the eight that added the most people (Houston, San Antonio, Fort Worth and Dallas were the others). New York remained the nation’s most populous city and gained 55,000 people during the year ending July 1, 2015, which is more than any other U.S. city. New York City consists of 5 boroughs, each of which is a separate county equivalent of New York State. The 5 boroughs are Brooklyn, Queens, Manhattan, The Bronx and Staten Island. Queens (16,700), Brooklyn (16,000) and the Bronx (13,700) accounted for the bulk of New York City’s growth. Denver joined the list of the 20 most populous cities in the United States, moving up two spots to 19th. It displaced Detroit, which fell from 18th to 21st. In addition, Seattle moved up two spots to 18th. Denver and Seattle were both among the nation’s 11 top numerically gaining cities. Among the 15 fastest-growing cities, the only one outside the South or West was Ankeny, Iowa, a suburb of Des Moines. It grew by 6.5 percent, ranking third. Ankeny completed a special census on Dec. 10, 2014, that showed the population to be 54,598. The 2015 estimate puts the population at 56,764. The statistics released today cover all local functioning governmental units, including incorporated places (like cities and towns), minor civil divisions (such as townships) and consolidated cities (government units for which the functions of an incorporated place and its parent county have merged). Seven cities crossed the 100,000 population threshold between 2014 and 2015: Hillsboro, Ore.; Vista, Calif.; Greeley, Colo.; Davie, Fla.; San Angelo, Texas; Jurupa Valley, Calif.; and Renton, Wash. 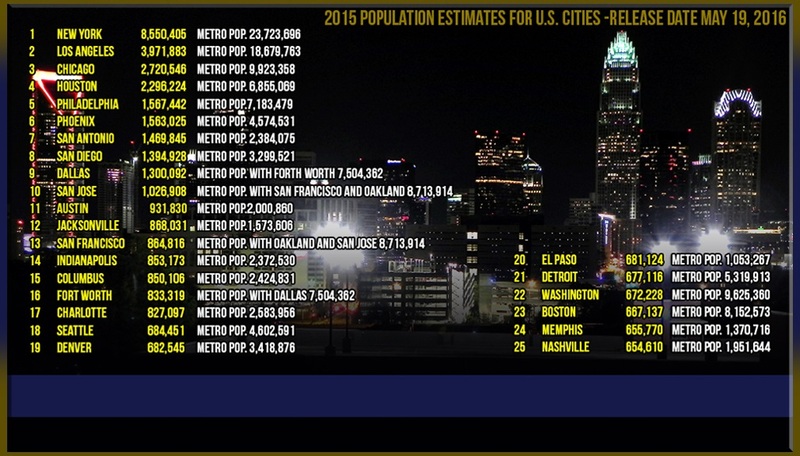 Seven cities crossed the 50,000 population mark for the first time between 2014 and 2015: Poway, Calif.; Bonita Springs, Fla.; Edina, Minn.; Galveston, Texas; Logan, Utah; Leesburg, Va.; and Olympia, Wash. Two cities dropped below this threshold: Troy, N.Y., and Charleston, W.Va.
Aside from New York, each of the 15 cities that gained the highest number of people between 2014 and 2015 were in the South or West. Three were in California (Los Angeles, San Diego and San Francisco). Arlington, Texas, rejoined the list of the 50 most populous cities, displacing Cleveland. Among the 50 largest cities in the country, there were several other cities that moved more than one position on the population ranking list since 2014. In addition to Denver and Seattle, Portland, Ore., rose two positons to 26th; Baltimore fell three positions to 29th; Colorado Springs moved up two positions to 40th; and Omaha, Neb., fell two positions to 43rd. Last December, the Census Bureau released state population estimates that showed North Carolina crossed the 10 million population threshold for the first time. Contributing to the state reaching this milestone were Charlotte, which added nearly 18,000 people to make it the 10th largest numerical gainer in the country, and Raleigh added roughly 11,000 people to rank 18th. These two cities accounted for almost 28 percent of the state’s population growth. California and Arizona each had two cities on the list of the 15 fastest growing. Mount Pleasant, S.C., was the nation’s 10th fastest-growing city. Mount Pleasant is part of the Charleston-North Charleston metro area, one of the nation’s 20 fastest growing. Of the 19,505 incorporated places in the United States, around 76 percent (14,804) had fewer than 5,000 people in 2015. Only about 3.9 percent (754) had populations of 50,000 or more. Also released today were July 1, 2015, estimates of the number of housing units for the nation, states and counties. These estimates show that Texas gained more housing units than any other state between 2014 and 2015 (adding 162,000), with North Dakota experiencing the fastest rate of growth in the number of units (3.5 percent). Among counties with at least 2,000 housing units, McKenzie, N.D., added units at the fastest rate over the period, as the number rose 55.9 percent (from 3,760 to 5,862). To produce population estimates for cities and towns, the Census Bureau first generates county population estimates using a component of population change method, which updates the latest census population using data on births, deaths, and domestic and international migration. This yields a county-level total of the population living in households. Next, updated housing unit estimates and rates of overall occupancy are used to distribute county household population into geographic areas within the county. Then, estimates of the population living in group quarters, such as college dormitories and prisons, are added to create estimates of the total resident population.